Join Richard Steinberg and Norman Marks for a conversation about the effective management of risk. Rick Steinberg was a senior partner with PwC and led the development of the COSO – ERM Integrated Framework. Norman Marks, who is not only an OCEG Fellow but an Honorary Fellow of the Institute of Risk Management, is a retired executive who has led both the risk management and internal audit functions – and has a new book published, World Class Risk Management. What are risk and risk management, anyway? Should the ability to manage risk be an essential management skill rather than a separate function and process? Why do so many top executives and board members see risk management as a compliance activity rather than helping them achieve their objectives? What is the relationship between risk management and internal control? What should the board be doing when it comes to risk management? 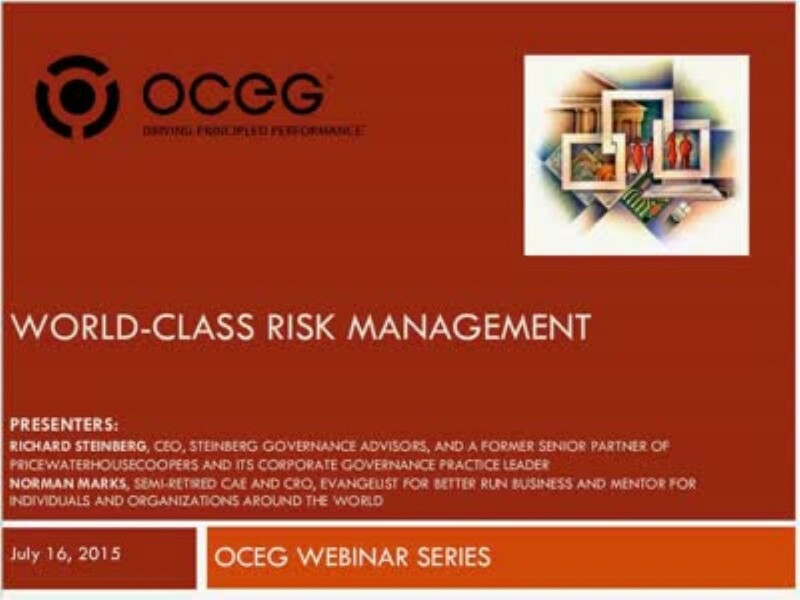 What constitutes world-class risk management?